Today I have my buddy Andrew Warner on the show. I met Andrew at an entrepreneurial mastermind in San Francisco last year run by John Corcoran. And then he had me on his show Mixergy where he grilled me, asked me all sorts of tough questions, made me uncomfortable and basically tried to make me cry. Fortunately, I held it together and now it’s payback time. Anyway, I’m really excited to have him on the show because while he does a ton of interviewing of other entrepreneurs, he rarely gets interviewed himself. Enjoy! If Andrew were to start Mixergy all over today, what would he do differently? Andrew’s business model for his interviews and how he morphed it into courses. Steve: Welcome to the My Wife Quit Her Job Podcast. Today I have my buddy Andrew Warner on the show. Now I met Andrew at the entrepreneurial mastermind in San Francisco last year. I don’t know if it was last year, run by John Corcoran. Then he had me on his show Mixergy where he kind of grilled me, asked me all sorts of tough questions, made me uncomfortable and basically tried to make me cry. Fortunately I held it together, but now it’s payback time Andrew. So I’m really excited to have Andrew on the show because he does a tone of interviewing of other people, but he actually rarely gets interviewed himself. With that I want to welcome the Howard Stan of entrepreneurial interviewing, Andrew Warner. How are you doing man? Andrew: Good, did I really ask you stuff like who you slept with? Is that where the Howard Stan stuff comes from? Steve: You know what’s funny is I forwarded that interview to a bunch of friends and they were like, “Wow Andrew really grilled you in the beginning.” He was really trying to crack you is what they felt. I didn’t actually really notice it, because I’m kind of used to your style. You tried to ask questions that are a little bit more uncomfortable I feel, right, on purpose, right? Andrew: I want to get really personal. I want to get to know the person, but I do sometimes, I wonder if sometimes I walk over the line because Alex from WP curve is a guy who lives locally and I asked him to do an interview, and he wouldn’t do an interview with me. Then, I asked him why we hadn’t gotten together more and over dinner he said to me, “You asked me really personal questions, and I don’t like to talk about this stuff.” I said what? “You asked me who I slept with first, like who I lost my virginity to.” I realized all right maybe I wasn’t fully paying attention to how sensitive he was to that stuff, and I thought maybe he was okay with it. I’ve been more cautious lately. The reason I want to know that stuff is I feel like we are shaped by more than just our drive. I think our drive is incredibly important, but I feel like what drives us, where the drive comes from is personal issues, like how long did it take you to lose your virginity, or were you a dock in high school? Were you like me where at first I will say I wasn’t a dock in high school, but second I grew up in a city where everybody was freaking rich. Of course that is the direction you want to go to. Steve: It’s interesting. I mean, I tend not to go on to anything personal. I’m more like interested in like the how-to-gets sort of thing, but you are right. The psychological aspects do come into play. I’m sure we’ll find out some of the reasons why you did what you did. Let’s start with that actually. You first business Bradford and Reed, it did 38 million in revenue, then you sold off for a pretty decent payoff, right? Andrew: We did okay. What we did is we sold it off in pieces, and yeah it wasn’t as great as I hoped it would be, but it was good, the bigger the … Yeah. Steve: Well I mean the point was you started Mixergy; you already had a pretty decent windfall of money at that point, right? Andrew: Yeah, I did well. Steve: Yeah, so most people would take something like that happening and just kind of relax a little bit, but then you decided to start Mixergy and so kind of what was going on in your head at that time? Andrew: You know I did want to relax. For a while there I didn’t want to do anything else for the rest of my life. I really enjoyed reading. I love reading anyway, so I had a lot of time to read. I enjoy that. I really enjoyed the coffee that I got when I lived in Venice Beach. It wasn’t especially good coffee, but maybe because I had no care in the world it was a great walk two blocks in the sun to go get my morning coffee. I didn’t think I ever want to work again. You really could live pretty decently in parts of the world. I was living in Venice and I could live there for maybe forever unless I screwed up somehow. Steve: So why did you start Mixergy then? Did you start getting bored or is that …? Andrew: At some point I saw myself start to inch back into business. I saw myself saying, putting posts up on Craigslist saying I want to just coach people for free. If you are interested just let me know, and I will get on a call with you. I started just inching my way towards it a little at a time, like an alcoholic who would say, you know just one drink after dinner with friends is okay. Just one drink on my own to go to sleep is fine. And then go and then you get got caught back in it. So that’s what happened. Steve: So the money wasn’t really the intention then? Andrew: No, for the most part it wasn’t, but at the same time I remember saying, I got a dog and I remember saying I should name the dog Billy to remind me that I’d like to be a billionaire. There must have still been some of that financial drive. Steve: Okay, interesting. I don’t think Mixergy is going to take you to billionaire status, or maybe it would along the way I guess. Okay, you were again bored, you had this itch, you started Mixergy, what– so your purpose really was it to meet people or was it to make money? Andrew: My purpose initially with Mixergy was to create a movement. I thought all right, I did business, the next thing after that is you just live your ideas behind. The people who I admired, Andrew Carnegie is the guy who I named myself after out of very weird fine names I said I needed a better name. I said I really admire Andrew Carnegie. I read about him for years. I took his name. Then I said, one of the things I learned about him was he built up his business and then he wrote a bunch of books that I was moved by. He left– beyond the books that he wrote himself, he didn’t write that many books, but beyond the books he wrote himself, he also inspired other books because of the philosophy that he put out there. I thought that’s the path I would like to follow in my life too. I would like to make some money, and then I would like to live a legacy and books I don’t think are the ultimate answer, because they kind of disappear in a world of lots of books. I’ll start a movement and I started it, but I was never clear about what the movement was about. It kind of fizzled out. Then I said, all right this thing fizzled out, I’m a little more humble now. Why don’t I learn more? I think the best way for me to learn is to bring on people who I admire, ask them questions and just get the things that I’m curious about answered. Steve: I’ve actually been a fan of your work for sometime even in the early days I think when you were just audio only, then you kind of evolved to video and now you are doing courses, communities, masterminds. There’s a lot of people who’ve kind of tried to follow in your footsteps, and I don’t really think that a whole lot of people have actually achieved the same level of success. What I kind of like to cover today is, I don’t know if you listen to a podcast, just like a tone of interview shows, my show is like an interview show. If you were to start Mixergy all of over again, in today’s age, when everything is kind of saturated, how would you go about doing that? Andrew: I wouldn’t pick start ups as the topic. I think I went too broad. I think I needed to be a lot more targeted. If it was about how to build a business, then maybe what I would do is say this is me over the next year going to work together with everyone listening on a framework based on the interviews that I’m doing. And I’ll just keep reporting back on what I learn. It’s a podcast about creating a framework for starting a business. I’d even get tired of that what kind of business I wanted to start, what kind of framework we were looking for. I would do it because I wanted to have ultimately a movement and a framework that comes from that. If I was doing it for money the way that other people are, I would pick a much narrower topic and obsess on that. I think the idea of just start ups is just way too broad. Then if you think about it, it is. Andrew: What am I selling to this audience of people? Some of these people have businesses already. Some don’t. Because they are just listening to other entrepreneurs tell their stories, that appeals to people who have big companies and also people who are just starting out. Some of them are really into marketing, others have people who do that and don’t care about marketing. Some people are really into a software, some of them just don’t have any software experience. Some of them are coaters. There’s not any one group of people in there that is highly represented and that needs one thing. If I would start over, I might say to myself, I’m going to focus on just let’s just build something out there, community. It’s going to be a podcast about how to build communities online and using specific kinds of tools. I’m only going to interview people who host communities, and I’m only going to reach an audience of people who want to start their own communities. Then there’s a natural product that you can start creating from that. People who need communities start to need things like maybe a course on how to create a community, or how to get people to talk more in the communities, or how to hire people to run those communities. Steve: So I’m just curious then, with Mixergy, have you kind of gone that route a little bit with the people that you interview, or is it still just anyone who has a business who’s successful? Andrew: I feel like– I was just talking to someone on my team today about how we are going way too broad. We are allowing too many different kinds of people on. We should narrow more. I don’t think that we could narrow down to one specific thing like community leaders at this point. I think it’s too far. What we need to do instead is having done over a thousand interviews, do a better job of curating, so that if what you are into is just educational products, you should find just interviews that relate to that and just the courses on the site that relate to that. Almost not see or know that the others exists, almost. Steve: Actually what is your curation process like, just curious? Andrew: What we do now is we have two different ways to do it. One is called tagging or standard tagging. We have a team that helps tag up the old posts. It’s hard because in an interview, I could be talking to someone about how he started both a software company and then how he moved to an information company. It’s very hard. We would tag it as both info product and software company, which would make it hard. Steve: Then like in terms of getting new people on, how are you screening people? Andrew: That we have gotten really good. I will say just the other way that we are curating the content on the site is we’ve also created collections and now anyone can create their own collections, and those collections will be public. So if for example you wanted to start an ecommerce collection, we would allow you to easily create an ecommerce collection for yourself and you could share it with other people if you wanted. For us, the way that we do it is we started out by writing out the steps that it takes to book someone on the site, and then created this flow for it in software called Pipedrive. Each one of our, we had at the time five steps to booking a guest, you know you find a guest, you find their email address, you invite them to do a pre interview, you invite them to do the interview and then you do the interview. We had those laid out in columns in Pipedrive and then anytime we had a suggestion for a guest, we would lay them in, we would put that guest in the first column, and then we just keep moving them through a process. Very much like a sales team would. If you operate in a really good sales environment, they would have a multistep process for closing a sale. Find your prospects, turn them into interested clients, then sell them etcetera. Steve: This wouldn’t be something that you would do early on, like when you are first starting out. Andrew: Oh, I will tell you what I do when I started. I would ask my friends to do interviews if I knew that they were good fit. Then in the interview itself, I would say to them who else do you know that I should be interviewing. At first people would say, well I know Donald Trump. You should have Donald Trump on. Steve: Is that the Miracle Morning guy? Andrew: Yeah, right. He used to be an ex salesman. I asked him how did you become a top night salesman where you just go into people’s home and sell them at night? He said every sales man would ask for referral, so I had this sheet that had 20 lines on it that were blank. The assumption was we were going to have 20 different people that you were going to recommend for me. And I’d say who do you know that I should be asking and talking to about these knives, and then he said, and he filled out this list of 20 referrals with them. The fact that it was a page with 20 gave people the sense that they have to come up with 20. Steve: So you had that side of the equation down, but how did you actually get the listeners. Was just kind of natural, or did it gain traction all the way. Andrew: The best way to get listeners is to have guests who have big names, or guests who are in the news. I’m looking at your list, who are some of the biggest people that you have on here? Steve: Good question. Let’s see I have had Noah Kagan, Emmy Porterfield. I mean these are just friends. Andrew: Yup, so Noah Kagan would be good. You can ask him then to tweet afterwards and ask him to post it on Facebook. Ideally he might even promote it to his mailing list and say here, this is the story of how I build up my business. But there are people who are even bigger names than that who draw in a much bigger crowd. Like, Barbara Corcoran for me. There was a period there where she was doing interviews and I had her on. Actually John Corcoran is her friend, no relations. Steve: They are not, yeah, okay, I was about to say they are not related, are they? Andrew: He is the one who introduced me. But she’s a much bigger name. I feel like the bigger names are the ones that bring in the biggest audiences. I used to spend a lot of personal time doing it, and I never created a system for how to get the bigger names on. One of the things I’m doing this year is I’m working with someone on the team who can own that, and start going after the bigger names for us. Steve: Interesting, but you have to have to actually have something established in order to get the bigger name, right? Andrew: Yes, that’s not hard. You don’t necessarily have something established. I didn’t have something established when I asked Tim Feriss to do an interview for example. Andrew: What I did in the early days was, I went to Mashable and said, “If I get Tim Feriss to come do an interview with me, can I write a post for you about his seven tips for working four hours a week or something?” And he said yeah, because he’s a good name for them and so I go to Tim and I say Tim, can I do an interview with you, it will also be the next update for Mashable. Andrew: And so there are people who have huge followings. I’ve actually seen the e-mails that Product Hunt, if you look at them, they have really big names for their podcast, so I went to Eric’s office and I talked to him about interviewing. I told him– I gave him some tips. I gave him some feedback on his process, I told him it worked for me and then I said, “Can I see how you get guests on?” He has guys like Tony Robinson; he has huge venture capitalists on. I saw the email he sends out; it’s– do you want a reach? Then he has a number of people that he has in his audience and then he says, “Here is the site, you want to come on and do an interview?” He has huge audience. Product Hunt is huge, and so people say yeah, so you may not when you are starting out have a huge audience, but if you can partner up with someone who does and create an interview for them or accept their blog post based on an original interview, they’ll be open to having you do it. Steve: How did you get Barbara Corcoran? Andrew: It was just John. That’s another great thing that helps us. John is an incredible friend for doing that. Steve: Yeah. One thing I’ve noticed, and the reason I started my podcast wasn’t for money. It was just to reach out and meet people, and then the money just naturally comes in, like people want to sponsor you and what not, and so is John someone– actually how did you meet John? Andrew: I have no idea. Steve: I don’t either actually. Andrew: I have no idea. I think he was in the audience; I know he was in the audience. I know that he was a member of the sayeed [ph] I think that must be how it was, but then I think we’d discovered that we were in the same city, and so I invited him over for a branch at my house. He and his wise came over, then his son popped in and that helped us connect. Steve: No advertising? Any other sources of traffic? Andrew: Oh wait, I’m looking at my inbox to see who else is referring me to people and suddenly John is inviting me, here’s one of John’s great technique’s. Andrew: It says, “Do you want to get together with me and Zvi Band of Contactually for dinner?” He’s coming to town. He’s done this before. So then I say yes, and then he goes to the next three people and says, “Do you want to come to dinner with Andrew from Mixergy, Zvi from Contactually and me?” And yeah, then you end up in this great group of people who are all getting together for dinner. It takes some effort, he’s good that way. Steve: You know what’s funny about that is, sorry to interrupt, but yeah, so with my conference, when I was trying to get speakers, I started out with one guy. I did the same thing as John did, and then once you have like critical mass, like getting the last speaker is a lot easier than getting the first couple. Andrew: Yeah, and the cool thing is that he’s saying to me, this guy is only going to be in town for this one day or for a short period of time, so now I’ve got some deadline that I have to jump on. Steve: Yeah, a sense of urgency. Andrew: I can’t say it right. Steve: That guy is genius. Andrew: He’s good. Actually, there’s nothing in here that is brand new. He’s not creating anything that wasn’t in the Never are you Alone or other books. What’s impressive about him is that he does it, that he actually uses it, and I’m finding that a lot of the ideas are really out there. I can talk all day about how to find get great guests; I can talk all day about how to build an audience. Ideas are out there, but most people don’t end up using it, and using it consistently and improving them to small degrees that most people won’t even know exist, until it actually works. I can tell you, our booking process was a standard salesman booking process. We laid out our steps for booking guests, we started putting a lot of people at the top of our funnel, we kept adjusting the way that we ask people to come and do interviews, we kept adjusting the way we found peoples email addresses. It was a small twist and nobody would ever discover. That nobody would ever pay attention to, that made all the difference for us. Steve: Such as? You can’t make a statement like that without revealing something,. Andrew: I’ll give you a really good example. We had to start this five step process that I described earlier, and we still were losing people, so we wanted to see where we are losing people? It turns out we would ask them if they want to do an interview, and then they wouldn’t respond and that’s where we stopped, so I added a sixth column to our steps. One is, ask them to do a pre interview. Then if they don’t respond, the next step is, send a reminder. That little thing made a huge difference. It got us from, I forget the exact numbers, but it was something like 20% of people would say yes to doing interviews to suddenly 60% said yes, because the follow up email almost makes them feel a little guilty for not responding to the first one, so it has an outsize performance. It delivers outsized performance, so that’s really big. We then did the same thing for people who did a pre interview with people on the team, with Jeremy Wise, so the mastermind that you did. They did a pre interview, then they wouldn’t book the interview because stuff comes up in life, so we had a reminder calling them to that. Suddenly, our numbers improved even more. Steve: Wouldn’t it be more effective to cut out all the steps and just have just one step instead of the three or four or five that you have? Steve: What’s with all these Cochrane people? Yeah sorry, go on. Andrew: Yeah right? It’s interesting, he spells his name differently– and he had the story where, usually when I ask people what did you do before you started your business, there’s some exciting thing that they did. He was talking about how he worked for three years at Rosetta Stone, and the more that Jeremy was talking the more– he got the story, but I don’t think that’s interesting, that’s completely left out of our interview. I don’t think that’s interesting, it’s completely out of it. There is one thing that he didn’t mention until much later in the conversation with Jeremy, because you can see even before the interview when I brought it up to him, I could see that he was a little embarrassed about it. He was on food stamps. He’s a proud guy, Christian guy, feels like he has a responsibility of his family. He didn’t want to go on food stamps. His wife urged him to do it and he did it back then. Andrew: So now there’s a hook, and so the pre interview process is where we discover that. Where I neglect things that people think are really interesting, and where I hit on stuff that really is going to be fascinating. Andrew: I wasn’t sure and what I did was I test the waters before the interview starts, and I also know what am I going to ask him before the interview. I wanted to see, did you go on food stamps after you started the business, so that maybe the business led to that, right? I checked it out and then I looked at him because we were on camera, to see how uncomfortable was he about that, and I saw he was okay and if not I would have had a way of getting him to feel more comfortable with it. Steve: I see, interesting. From what you’re telling me here is that Mixergy just kind of took of on its own. Steve:	Okay, all right, so you didn’t pay for any advertising, you got great guests, so what’s the missing link here? Steve: Actually I just saw a Facebook ad where you were advertising your Barbara Corcoran interview essentially. Steve:	And so how do you quantify the return on that? It’s just landing straight on an interview, right? Andrew: I actually don’t know how you can quantify podcast listeners. I’ve seen people do things like by cheap clicks. They go to their sites, auto play their audio and then they get it counted as a listener. And that you can actually quantify because advertisers are paying per listener now, and if you can get your clicks cheap enough, then you could increase your numbers and then hopefully you said something that would get that person to also listen again in the future. Steve:	Is that your goal? Like what’s your Facebook ad goal? Is it a newsletter sign up, a listen or…? Andrew: A subscriber, so I’ve never really paid much attention to the podcast audience, not enough. We’ve done podcasting; I’ve been podcasting for years, since 2008. I didn’t pay much attention to it. Then last hear, 2015, this guy [inaudible 00:24:26] said, “Andrew, can I sell ads for you because I think can do a better job than you’re doing,” and then I said, I think am going to stop selling ads because I don’t care about that revenue, I don’t care about it and it’s a distraction. He said I think there’s more here. So I said okay, do what you want. I don’t even want to know what you do because you know me well enough that you know not to pick bad advertisers, and you know how I work, I’m very systemized. You create the system, so he did. Then his ads were selling for– I was hardly selling them frankly, for like a 1000 bucks a month, he’s doing 50,000 a month. Andrew: I don’t know the exact numbers. Somewhere like that, yeah. He slowly ratcheted up the numbers to make sure that we were worth it. Steve: This is just from your podcast. Andrew: Just for the podcast. Steve: Outside of Mixergy, Mixergy is the podcast, right? Then I’d vet his ideas, I feel are a little too much, or I’d interfere a little too much, and I finally, at the beginning of this year, he and I went out to work together in person at the Fairmont hotel which I like working in. And I said, “You know I trust you, you’ve gotten me here. What if we take,” I forget the number but I think it was like 20,000 a month, “Can you do– how much is it going to cost?” I think I started with 5,000 and he ratcheted me up too like he did to the advertisers to 20,000 a month in advertising. He said, “I think I could grow it for you,” and I knew that if I was going to ask him, how are you going to measure the results? I knew the response wasn’t going to be something that was especially helpful for me, so I just said, I don’t even want to know. Tell me what you need from me and just go do it. He needed a couple from things from me, and I couldn’t even respond on those because I’m so overbooked. He wanted to know, he had a list of questions for me about who the Mixergy audience is and so on. I said I don’t have time to even respond to that. He said, “Okay, I know you well enough. I could respond to it myself,” and he went on and bought the ads. He didn’t even show me the Barbara Corcoran ad. I had sensed that’s who he’s going for. Steve: Okay. Can we talk about your revenue breakdown? I don’t need specific numbers, but I’ve always been curious. You mentioned there’s sponsorship revenue, there’s the membership, and then you have courses and what not. And you just mentioned that you are thinking about dropping sponsors? Andrew: I was, at the beginning of last year. Andrew: It was horrible, and frankly I also wasn’t also running it well because I never thought the podcast ads would do well. I just couldn’t imagine it. You think about it, how many times have I listened to a podcast where I remember the sponsor name at the end of the podcast? Hardly ever. I never remember them. I’d like say close to never. In order for the podcast go even get credit, the listener has to remember that they heard it, remember that they heard it on this specific podcast, and then remember the code, so I just didn’t think anyone would do that, but they are doing it. Andrew: They are doing it, so that’s why you never, hardly ever heard me mention a discount code within the interviews. If an advertiser said, here’s the discount code, I’d say I don’t think you should give a discount code. Why give people two things to remember, just give me your name, and sometimes I’d like do it, but grudgingly and I didn’t care about it, they didn’t care about it. Steve:	By the way, when you are talking about podcast right now, you’re talking about just everything, right? Like the Mixergy interview. Andrew: Here’s the thing. Everyone thinks that me reading the video, the video counts, videos chuck [ph] now, it’s not worth anything, really. For revenue, it’s not worth anything. Steve: Interesting, the Mixergy premium memberships? Andrew: Oh no. Premium members do listen to it, but as far as ad revenue, as far as viewership, it’s just insignificant, because no one goes to websites anymore to watch content. You go to YouTube if you’re going to watch videos, right? And we don’t put our stuff on You Tube because it’s for members only. Andrew: Right? So if you want to look at pictures, you go to [inaudible 00:28:38] you go to Reddit. You don’t go to some guy’s website where it’s going to be interesting, right? There was a period where you might go to failblog.org and watch it there. Nobody does that, right? You’re just going to go to Reddit and you’re going to find it there, so platforms are where it’s at. Mixergy is not a platform on its own. People aren’t coming to watch videos on our site. This is something search would help me realize, podcast is big because podcast is on iTunes platform, and so that does well. So when we sell ads, our advertisers sometimes get excited about being in this video interview, we have to tell them look, you’ll be there, but it’s the audio that’s really going to give you the big bang. They want the links to their sponsorship on the page. Andrew: We do that, but in reality it doesn’t really matter much because people aren’t coming over and clicking. I would always have some link to it, but not the long descriptions that we have because someone could forget. Who did Andrew mention, I know he mentioned some hosting company, I know he mentioned some developer company, who was it? And they want to go over to the page and click on it, but they are not coming to the site, they are not coming to watch the videos. Steve:	Has that eaten into your membership revenue then? Because your podcasts are free, right? It’s the same interview. Andrew: It’s the same interview and then a few days later it goes in behind the pay wall. Steve: You take it off the feed for the podcasts? Steve: Okay, I see, and when did you come to this realization, just last year? Andrew: Frankly too late, it was end of last year beginning of this year, the day that [inaudible 00:30:12] and I sat together at the Fairmount. I like him because he keeps pushing me to think differently. I like crazy people like him, because he always has some crazy new direction and so he says what if you just kill all the video? Why kill all the video? And we started talking about it, because he is just throwing stuff out there to see what happens. And we looked the numbers for the videos and they were insignificant compared to podcast, and then that made me realize wait, what if people aren’t going to the video anymore? And maybe the video is destructing them making them think that it’s only a video site. Then I emailed our developer and I said, can you take down the video for everyone who is not a member and see if anyone complains. I learned that from David Cowen the founder of [text stars] [ph] the investor. He said, if you want to know if a future really matters to users kill it, and then see if they complain. If they complain you can always bring it back, if they don’t then you realize it doesn’t really matter that much to them. So I killed it, no one complained and then I had second thoughts about it, so I said Michael deemphasized it just put audio first video second, but no one is coming to websites anymore. Steve: Here is the thing like we are talking to each other and usually I don’t turn on video for these interviews, but we have video on. You don’t think that the ability to see a person’s face matters in an interview? Andrew: I never did, but I know that there is an audience for it. I’m just saying that if you really want to build an audience for people watching an interview, you are better off putting your stuff just on YouTube. I don’t want that, I find that — I pick the platform that I want which is podcasting, and that’s where I want the new audience to come from, and then videos available for members. Steve: So percentage wise then would you say that your podcast has over taken your membership revenue? Andrew: No, so what happens is people will discover — people used to discover me by going to mixergy.com, and watching a video there. And then seeing that I also have a membership site and signing up. Now the way they discover me is by going into the podcast, and they go to the iTunes store or something, they discover the podcast and then they sign up. And then they get into my world and then they come to the site to see who I am. Steve: And then did they watch the video on your site at that point, like do the premium members watch the video? Andrew: Premium members do watch the videos, and then the course is a video based still. So what happens is you get the interviews for a few weeks for free, if you are happy with them and you want more you can come back to the site and pay for membership and get access to all the older interviews. And when you pay for that it as part of your monthly membership you also get access to all these courses. And the courses will teach you things like how to get traffic to your site, how to grow sales, how to automate your marketing, and the whole thing is taught by real entrepreneurs they turn on their screen etcetera. Steve: Can we talk about how you evolved the courses, because it wasn’t something you added until what two or three years ago or something like that? Steve: So how did you get the idea and it just at the time it seemed kind of random, but it’s clearly working, right? Andrew: Yeah, I did know that people don’t pay — people pay for results, they don’t pay for just entertainment. So I kind of had a sense that that’s also where I want to play in delivering some kind of result, and I wanted to be in education because that’s the stage of my life where I am, but I wasn’t sure where to generate money from it. And I was much more excited about selling to my audience than selling ads. I finally just admitted I didn’t know what to do and I did this thing called testing Tuesdays, where I wrote a post where I said every Tuesday I’m going to try selling you something until I figure out what to do. And I did guides because I thought that was number one, I thought guides for sure. I did an online webinar with someone I think Mel Kegan was the guy who jumped in with me on that, I did a bunch of different things to see what worked best. The courses were the one that did the best. So I stuck with that, and at first I sold them all individually so I said each course sold individually and if you have a membership since I already built my membership to sell the older interviews. If you have membership you get it for free. And dude I spent so long not just me my team even longer than me hooking up each one of these courses into a process that would let you buy them individually or buy them with a membership. Then I finally just got so tired of doing it both, and putting my people through so much work to sell them both ways that I said, all right, let’s kill it, let’s just go for membership and just go with all in our membership which is what we did. Steve: How do you reduce churn on your memberships, like how long do people stay usually? Steve: Yeah I noticed, yeah. Andrew: And I think that’s helpful for churn reduction because, maybe not. Churn is 7.4% right now, and that’s high for us, I don’t know why we suddenly have higher churn. It could be because we got more members recently, and maybe there different kinds of members. Steve: You get people to stay basically by constantly releasing new courses, is that…? Andrew: Yeah the introduction of new courses is the reason they stay, though I’ll be honest with you. I know that people know that if they cancel today they could always come back tomorrow and get whatever course was added in between the time they left and cancel. Or if they cancel today they could come back in three weeks or three months and get all the courses. So that’s an issue, one of the things that I have been thinking is people have been wanting more of a community, and so I’m thinking the community could help to channel a lot. But I’m still trying to figure out where it is, I have seen other people, other membership sites numbers, our churn has been better than theirs which is really reassuring. I used to think that anything above 2% is awful, but it’s not true. I see 10% is standard, 20% not unusual for monthly memberships, education based. Steve: I think it depends on — oh education based, okay. Have you talked to [inaudible 00:36:15] I was just curios what his — I forgot to ask him this question on our last interview. Andrew: No, I wonder what it is. Steve: Do you do any on boarding like…? Andrew: We do, we should be even better about it yeah. Andrew: That’s part of Mixergy premium. Steve: You had an interview course is that part of Mixergy premium now too? Andrew: No, so I did have an interview course that was part of premium, I said I’m going to teach; I’m going to have all these entrepreneurs teach what they do best. I’ll teach one thing that I’m really good at. And I know I had to do interviews, and had to start an interview business, so I’ll add and I did. I did an hour long version of that and it was really popular. And I kept — when my wife gave birth, I kept getting emails from people asking me questions about how to do interviews, and I realized because I had some distance and I wasn’t at work that there is so much, there is so many request like this that I should just create a course on it, and so that’s what I did. A bigger, fuller course much more expensive, much more time commitment, much more engagement. Steve: And I’m just curious, I imagine a lot of these people they are interviewing other entrepreneurs and what not also, how have they been doing since it’s a lot more saturated now. Andrew: Some do really well, some don’t do as well. I don’t have numbers on it and I frankly I should, because that’s the way I should be measuring my success. Sorry? Steve: Do you have any example of someone who has done really well? Andrew: Yeah Tucker Max, he loved the course, he went through the course, he was trying to at the time create a business that mentored authors essentially. He said all these are really bright, but they are too busy working and don’t have enough time to write books. Meanwhile there are all these guys, these knuckleheads, that’s my word for it, who don’t know anything, who write these freaking books, where they sound like experts because they have all the time in the world to write their books, and all the time in the world to promote themselves. So Tucker said I think I should turn these other guys, these experts into authors and he needed to know how to interview them, and how to have a team of people interview them in a way that lets him create these books. So he took the course, and he is really into the question process, he built it. He created a company called book in a box; if you talk to him you’ll see that he is a big reader. And he showed me some books that he read to help him to figure out how to ask questions, how to interview, and some of them are good, but he said the course was the best thing that he had taken, the best place that he did learn to do it. Steve: He was a rock star to begin with so right, even before he took your class? Andrew: But his people weren’t, he didn’t know how to get his people who were just total off the street people to ask questions. But I see what you are getting at, who’s built a business based on this? Right, we had other examples that we put online, and you are right I don’t have any others that just come to mind right now. I wish we did a pre interview; I would have spent some time looking it up. Andrew: You should do the pre interviews. I used to think I had to do the pre interview, here is a problem with me doing the pre interview, and I did it for a long time. People would tell me things and then in the interview they would assume that they already told me, and I would be bored by it, so they shouldn’t spend too long, and so they would stop their best stories. The ones that I was most excited about, because I remember being excited which means that they remember me having heard it before. Andrew: I think people could use a little bit of practice when they are telling their best stories because if they are really excited about it they lose their place. They get too excited and too caught up in the moment of telling it. Steve: I was actually looking through your portfolio products, and it seems like you are almost like in an exploration type of mode so to speak. I mean you have a whole bunch of stuff, your True Mind program. There is something I think I just got an email back today right that is closing the doors. You’ve been running Mixergy for a long time now, and I was just kind of curios what direction you are taking moving forward, and we kind of talked about this a little bit before this interview started. Andrew: I am, you are right, I feel like I am the least clear that I have ever been all of a sudden this year. Usually at the beginning of the year I’ll sit down and I’ll journal out where I want my year to go, and 2016 is the first time I really couldn’t do that, I’m not sure, I’m not sure. Steve: What is this True Mind program about; I mean you sounded really excited about it when you were talking about the pre interview, right? Andrew: I am, here is what I noticed that people who are listening to my interviews, who go on to build incredible companies, none of them come to mind right now, but you’ll hear them in the interview say, that they listened to Mixergy while they were building their companies. Actually one guy is the founder of any park. The guy was listening to my interviews when he was in Japan, got really into them came back to San Francisco not too far from where I am. And decided he wanted to be in tech, because he didn’t have anywhere to live, didn’t have any entrance here, he slept in a van outside of Taco Bell. Finally before he was due to get out of the country he said I need to meet some people here, he went to a tech conference, this strap conference from tech ranch. He couldn’t get in because he didn’t have a ticket, they are like $2000 or $3000 tickets, he didn’t have that kind of money. So he walked over to the receptionist and said, look I speak Japanese, you guys probably are going to have Japanese people in here who need a translator, I’ll be your in house translator if you let me in, they let him in the conference. And he never needed to translate for anyone, but he did get to meet Paul Graham, he said to Paul Graham you told people who listen to your work that they should be coming to San Francisco, I’m here now what do I do, you at least listen to my pitch idea? Paul Graham said okay, listened to his speech idea, and founded his company and today any park is doing incredibly well creating parks for companies to give to their employees. And I intentionally within my interviews say Mixergy fan whenever I remember to when there is someone who is a fan who is listening from the early days, and if you Google it you’ll see that there are tons of people who’ve listened at the time. That’s the first like thing that I want to do, but you are right it’s not enough. Oh right so there are people like them, I promise when I talk to my audience I see people who are incredibly successful like them who aren’t well known, who won’t do interviews, but I also see people who don’t go anywhere, who are just freaking stuck. And the difference between the two of them isn’t intelligence. The people who are stuck are often brighter than the people who are going further. They are like really good developers, really sharp, they work hard. And what I realized was what was holding them back is the same thing that used to hold me back, the sense that they are not ready, the sense that its meant for other people, the sense that this inner critic. And they would talk to me about it in private, and I recognized it myself that I had that too. I said we need to deal with that. you’re over scotch, but not publicly. I said let’s all work together on dealing with this inner critic. And we did, and it was just like me and a bunch of premium members who didn’t have to pay anything extra to talk to me and work with me, and I did a ton of work with them on this. We realized it’s not just the critic, it’s this part of our minds that we all the counters everything we want to do, I’m not sitting here to do an interview with you, and there is part of me that says I’m not going to be interesting enough. I’m not directly a good fit for his audience, what if he asks me a question that makes me look bad, right? That’s counter mind that if I start to notice it you’ll see me drift of in conversation. You’ll see me not fully engaged with you; you’ll see me hold back, you’ll see me like break as soon as you ask me a tough question. It is just there, it counters everything we do, someone who is listening to us right now who wants to start a business like you is going to think oh that’s not me; I don’t have a wife who is supportive. I don’t know anything; all the good ideas were taken etcetera. Or maybe this guy is actually, maybe Steve is actually cheating me or using me, so I don’t want to even listen to him, and it’s a counter mind, we all have it. Steve, because if I get an hour with you then you and I don’t get to spend much time together, right? It’s good for me if I get to help you out it’s a win because you are going to help me out at some point of my life, you are going to help me think through something, or I don’t know what, maybe you’ll throw a link in something a few years from now that will help me right? So that’s something I just want to do a good job for you. There is another part of me that says maybe I want to meet someone in this — through this interview that’s going to be helpful for me. Maybe I can actually help somebody and change their lives the way that I wanted to when I was in Venice beach feeling like I’m not living up to my potential, right? That’s a true mind. That’s the part that we want to spend more time thinking about, more time experiencing, more time expressing, and that’s the difference that I noticed. When you see someone who is building a great company, someone like [inaudible 00:45:18] who walks into a conference and says I know Japanese. That’s not coming from a guy who is obsessed with his counter mind which says you don’t even know, you have an accent, he has an accent. That’s not coming from a guy who was listening to his counter mind which would say, everybody wants to come in here for free, they are not giving you a free ticket, right? He’s expressing his true mind. Now, how do we do that more often? How do we get to focus on that more often? That’s something that I got really passionate about and started talking about a couple of years ago, and then I created a course for it, and you can see people with their [inaudible 00:45:52] way of remembering what it’s about, you can see people with their beads, you can see people who views them, who’ve gotten results from them, who’re sharing it with their friends and getting results with their friends for it. When I told you before the interview started there’s a part of me that just wants to stop everything on Mixergy and just focus on True Mind, it’s because of the responses that I get from that. I spoke at a conference and one of the volunteers at the conference came up to me and talked to me afterwards, and I didn’t realize that I made an impact with her on this whole True Mind thing. I gave her a set of beads and I moved on and … I just said here it is and you know the process– oh, I gave everyone at the conference beads, actually now that I think of it, but I don’t know if I had to give her a specific extra set because she was a volunteer, but I gave her a set of beads so she can use this process with them, and she emailed me at the end of last year to say how helpful this whole thing has been for her. I didn’t know what she was going through, but she emailed me to say that she was going through a bunch of stuff, and this helped her focus on what she wanted and helped her get results in the part of her life that mattered to her. It took me a long time to get that kind of response from Mixergy. It took me a long time to get someone who cared that much about Mixergy, so that’s why I’m thinking maybe True Mind is what I should be spending more time on. Steve: You know what’s interesting about what you’re saying is for me at least; I do get imposter syndrome sometimes, but am more concerned about not understanding what to do. I feel like once I understand what to do like I have all the confidence in the world. Steve: For example, if I wanted to learn how to run Facebook ads for example, and I was not confident because I don’t know how to use it at all, once I gain the knowledge and actually execute on my own platform, I would feel comfortable teaching it, so to speak, or I’d feel comfortable running someone else’s campaign. Andrew: I get that. The challenge is that, how do you get to a place where you know it well enough that you can actually do it for someone else? For most people, they wouldn’t even get started, because in their heads they’ll think Facebook is already done, everyone who’s doing it is doing it. In their heads, there’s someone who is listening to us who’s thinking, there’s someone who’s already better than me at this. The world doesn’t need me especially if I’m starting at zero, why should I start anywhere, right? That counter mind is going to keep them from even starting. I’d also suggest to you that if you are waiting to know everything, then that’s also you giving in. Not necessarily you, but if a person is waiting to know everything that’s also giving in to their counter minds. I can’t possibly know everything going into every interview. If I wait to know everything, then I’m not ever even going to do the interview. I get on call sometimes with customers who are upset. I can’t possibly know how to respond to everyone who’s upset. There was a part of me when I was younger which said, you have to read a book on how to handle disgruntled customers, you have to have some experience working for someone else who teaches you how to handle disgruntled customers, and then you can handle your own disgruntled customers, right? Then you know, there’s always like one extra thing I had to do, there’s always one other book. I remember when I was growing up and I wanted to sell– to shovel snow for my neighbours for like 20 bucks, and whenever they would say no, I remembered thinking, I have to read The Art of the Deal because I don’t know how to negotiate with them and get them to say yes. Like that book was magically going to sell before me, so I read The Art of the Deal and then I said, I have another book that I need to read before I can really turn these people around. Andrew: When all I should have done was had the confidence to say, really? Are you really going to spend some time going and shovelling your snow, or just being okay with it and moved on to the next person? It’s the counter mind that keeps us from starting; it’s also the counter mind that always shows us that we don’t have enough. Steve: I get that a lot, since I teach a class. People come up to me and they’ll ask me a question that they know the answer to, and they just want me to say yes, I agree, and then they proceed. Is that kind of similar to what you are talking about? Andrew: Yeah right, they need that blessing. They need somebody to say it’s okay. There are so many people going to business school just so they could have that piece of paper that says that they know business, and then they are going to be so, so disappointed when they leave and someone is going to ask them a question, and saying I’m a business school student isn’t enough, or they won’t remember it from business school, or it wouldn’t have been taught and covered in business school. Steve: It will be interesting to see how your course unfolds; this is the first time you are running it, right? Andrew: Oh no, I’ve actually stopped doing it because I kept going back to Mixergy and the only thing that brought me back is the graduates, the people who’ve been through it keep saying what’re you going to do with it next, what’re you going to do with it next. And so I still said I’m not sure to them, and then I have a team of people now who say we are going to help you keep producing new stuff, and new stuff that you care about that’s like my ideas, not me promoting someone else on my interviews. And I said all right, here’s the next thing we are going to do. We are going to launch True Mind. It’s going to happen in January, and we are going to start it off and I said, “I think that January is a little overdone,” they said. “Yeah, but we’ll take care of it,” and so they organized it. Steve: Just curious, is everything that you are doing, is this like your calling? Like is it enough for you? Because I know last time we had talked, I told you that I need something technical in my life to keep me going. Is the stuff that you’re doing right now with Mixergy, True Mind and your other projects; is it what you are meant to do? Andrew: I think I wanted to do better, but I wanted to be this. I don’t want to do anything else. I don’t want to start a software company, I don’t want to retire, I don’t want to do anything. I want to do this, but better. Like, more people should be moved by the True Mind process and semi-results. I should be expressing it even better than I am today. Mixergy needs to be a lot clear as a platform, as a place to learn. You should be clear about what you are going to learn on Mixergy. You shouldn’t, you the person who just, you’re interviewing me, you looked it up. You should know more about what we are selling on Mixergy, what are those courses, right? And you couldn’t clearly say right now, because I think we need to do a better job of expressing that to you. Steve: I think the main reason is you just have a huge breath of stuff. Like just courses on like every subject practically in your library, right? Andrew: You actually would get a specialist, someone who is specialized in that. If it comes to presentations for example, a lot of entrepreneurs need to give presentations to their internal team, they want to do webinars because they hear webinars sell well, they want to speak at conferences because they know they get to meet other conference speakers, they get to meet an audience, they want to know how to do this. Well, there are courses where you can go and take on how to give presentations. It will cost like five, six, ten, twenty thousand dollars depending on where you do it, and whether it’s in person or not, right? Or you come to Mixergy, Nancy Duarte is the woman who taught [inaudible 00:52:53] how to create the inconvenient truth PowerPoint movie that became an Oscar nominee, maybe even won an Oscar, I don’t know, I don’t remember. She’s the one who teaches the biggest people in business how to give presentations. She did a course on Mixergy where she teaches presentation skills. Why would she teach it on Mixergy if she is also available to do it somewhere else, and why would you come to Mixergy to take that course as opposed to going to her in person thing. I think that most people need 20% of the material that will help them give the right webinar that will help them give the right presentation. That they can actually use and then decide whether they want the other 80%, and for most for people, they may not even want the other 80%, right? So you come in, you take a course with Nancy Duarte, she teaches you presentation skills and if you want, you use it and you are good to go. If you like her style and you want more from her, she has an in person course. She has a team actually; she’s now a huge company that will teach it to you through in person classes, there are people who’ll actually create your presentation for you if you want to do that. The same thing with Neil Patel. He teaches how to get traffic because he knows we have a big audience; they can learn from him. For most people, they could sign up for these multi thousand dollar programs that last weeks and weeks and weeks. Most people don’t want that. They want the 20% that they could use right away and get some results before they do more, and the thing that I had as an interviewer on Mixergy is, I had an audience, so if you are teaching a course, if you are Neil Patel, you are not coming in to an audience of zero where I, Andrew is saying to you, come and teach my people, but you’re saying Andrew has got this big audience, many of them are already paying him. If they are going to paying him to watch me, many of them are going to come and pay to watch my stuff too, because they have already proven that they care enough and they are willing to pay, and I also have a bigger audience that I email every week. 70 plus thousand people that are saying, “Neil Patel is an expert on how to get traffic, he’s teaching this on Mixergy. If you have a premium membership, you can watch it. If you don’t, you can sign up. Even if they don’t sign up, in their heads, 70 plus thousand entrepreneurs now know Neil Patel is a business person. That’s the model. I need to do a better job of expressing it 100%. Steve: Here’s the funny story on my end. I’ve in the past, given my course out to people for free. Just, these might be like friends or people who just want to learn, who know me, and everyone who I have given the class to for free has never done anything for it, and the people that I heavily discounted for, they end up doing something about it. Just the act of paying money, a lot of money has made them take action, so I was just wondering, for you, you get an all you can eat once you pay the lump sum, right? I was just wondering if that actually prevents people from taking action. Andrew: I think in many cases it’s okay to not take action. I’m all right with someone saying, I have a membership to Mixergy, I’ve checked out Neil Patel’s stuff. It turns out it’s not for me. It turns out that really his whole attitude makes sense. I’ve learnt it, I’ve internalized it, I understand it, I’m not going to do it, but it’s good for me to know how other people are doing things. It’s okay for somebody to go watch Nancy Duarte’s course and say; I actually don’t want to give a presentation. I’m never going to do this. My belief is that if it’s short enough and we do about an hour, they’ll watch it to the end and I’m seeing the numbers that they do watch it to the end. My belief is that, some part of it is going to stay with you. You might listen to Nancy’s Duarte’s presentation and see that she shows you how those speeches that have resonated with people for years, have these highs and lows and highs and lows and it’s an intentional process. When you give your next presentation whether you know it or not, that’s now part of your knowledge and you are going to adjust your stuff, your style so that you can do it, so that you can have a high and then a low, a high and a low, especially if she’s convinced you that it makes sense. If she hasn’t, then why spend even more money to take a bigger course? Steve: That makes sense; I can see it from both sides. Hey Andrew, we’ve actually been chatting for almost an hour now. I didn’t even realize that the time went so quick. I want to be respectful of your time. If anybody wants to get a hold of your latest projects, where can they find you? Andrew: The best thing to do is go subscribe to Mixergy’s podcasts because then you get everything, all the interviews for free when they come out. You don’t have to buy anything, you don’t have to be a member, you get all the latest interviews for free. It’s in the iTunes store and if you don’t subscribe now, then whatever is free now will eventually be, tomorrow will be prepaid members only. Steve: Behind the pay wall, yeah. Cool man. Hey, thanks for coming on the show, I really appreciate your time. Andrew: You bet. Thanks and I love what you are doing. I’m glad to be on here. 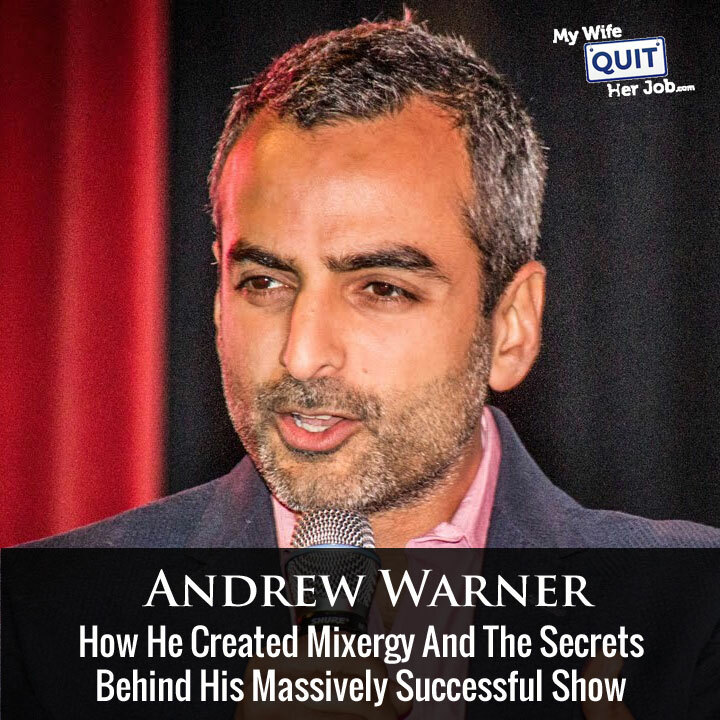 Hope you enjoyed that episode, Andrew’s success with Mixergy was actually one of the main reasons I decided to start my own interview based podcast, and even though we have different styles, I’ve learned a lot from him. For more information about this episode go to mywifequiteherjob.com/episode113, and if you enjoyed this episode please go to iTunes and leave me a review. It’s by far the best way to support the show and please tell your friends, because the greatest compliment that you can give me is to refer this podcast to someone else either in person or to share it on the web. Now if you’re interested in starting your own online business, be sure to sign up for my free 6 day mini course where I show you how my wife and I managed to make over 100K in profit in our first year of business. So go to mywifequiteherjob.com for more information, sign up right there on the front page, and I’ll send you the course via email immediately. Thanks for listening. Only my opinion … I don’t necessarily agree with him. I like to look at a persons face and then into their eyes. The eyes are like looking into the soul. Thanks for keeping “faces” on your podcasts!